New Orleans: 498 Productions, 2007. Hardcover. Fine. A pristine copy of the 2007 stated 6th edition. Tight and Fine in its pictorial laminate boards. 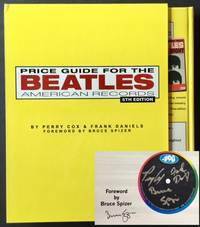 Tall quarto, Foreword by Bruce Spizer, WHO SIGNED THIS COPY on the title page. Also includes a very sharp copy of the yellow card slipcase, with very light wear along the bottome edge. Ann Arbor, MI: Popular Culture, Inc, 1995. Boards. Fine. A pristine copy of the 1995 3rd edition, 1st printing (limited to 1.250 copies). Tight and Fine in its pictorial laminate boards. Quarto, hundreds of photos and other illustrations thruout. The New York City Symphony, 1946. Near Fine. A nice example of New York City Symphony history -- and a wonderful piece of very early Leonard Bernstein ephemera. 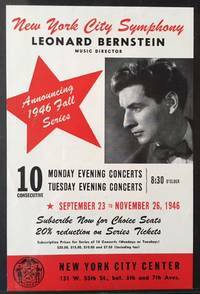 The original flyer announcing the 1946 Fall series ("10 consecutive Monday evening concerts/Tuesday evening concerts --September 23 to November 26"), with a prominent photo of the new Music Director of the New York City Symphony, a baby-faced, 28 year old Leonard Bernstein, who held this position from 1945-1947. The flyer has held up very nicely: crisp, clean and Near Fine, with vivid black and red titling offsetting the white backdrop. The flyer measures 9" tall x 6" wide and is well-protected in its archival plastic sleeve. New York: Lancer Books, 1967. Original wraps. Very Good +. 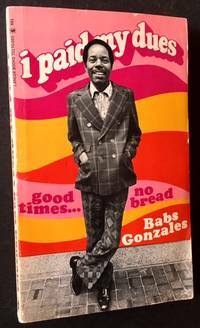 A sharp copy of this gritty 1967 Babs Gonzales autobiography. Clean, tight and VG+ in its pictorial wrappers. A pocketsized "Lancer Book" publication. By the "creator of the Be-Bop languages", Babs "tells the story of jazz and black and white and blue and beautiful. Down and Out, Up and In, High and Dry--Babs was there"
Llanfair, Gwynedd, Wales: Squiggle Records, 2015. Original wraps. Near Fine. 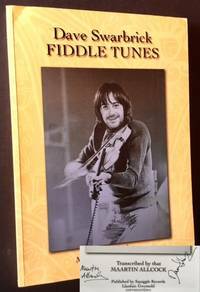 SIGNED BY BOTH DAVE SWARBRICK AND MAARTIN ALLCOCK on the title page. A very sharp copy to boot of this uncommon 2015 collection from Wales. Tight and Near Fine in its pictorial wrappers, with one tiny bump at the front panel's top-edge and very light creasing along the rear panel's top-edge. Tall quarto, generously illustrated, with black-and-white photographs thruout. New Orleans: 498 Productions, 2000. Boards. Near Fine. 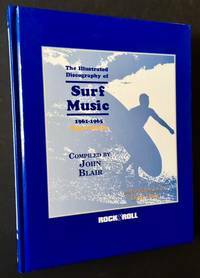 The 2000 1st edition of this exhaustive, remarkably impressive compilation, complete in 2 volumes and the publisher's matching slipcase. INSCRIBED AS WELL IN BOTH VOLUMES BY BRUCE SPIZER, who painstakingly compiled the entire project. Both volumes tight and Near Fine in their pictorial laminate boards. The slightest bit of faint bumping at one or two corners, otherwise bordering on pristine. Tall quartos, just shy of 500 pgs. all told. Vol. 1: Beatlemania & The Singles; and Vol. Two: The Albums. Literally thousands and thousands of illustrations thruout, including surprisingly high-quality color and black-and-white reproductions. Also includes an all-but-immaculate example of the publisher's slipcase, also in its laminated pictorial boards. 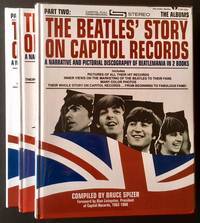 An uncommon, thoroughly-researched examination of the Beatles' catalogue on Capitol Records. London: Oxford University Press, 1974. Cloth. Fine/Near Fine. A very handsome example of the 1974 1st edition, complete in 2 volumes. Both volumes tight and Fine in their light-green cloth. And in clean, Near Fine examples of the publisher's acetate dustjackets AND a virtually pristine example of the publishers printed cardboard slipcase. Thick octavos, over 1,400 pgs. all told, edited by Maud Karpeles. 1969. Original wraps. Very Good +. 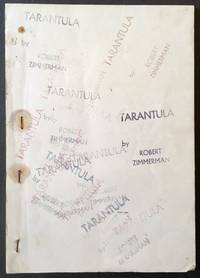 Stamped mimeo bootleg of Bob Dylan's "Tarantula", which opens with the Dec. 1969 interview between Dylan and Jann Wenner of "Rolling Stone". Appearing just before the 1970 1st trade edition, this remains among the most colorful and appealing of the various bootlegs. In its staplebound wrappers (missing 1 of the 4 original staples yet holding very firmly), with multi-colored, seemingly-random stamped titling along the covers. Solid and VG+ in the off-white wrappers, with very light soiling to the panels (including a bit of staining along the staples). Quarto, for Dylanologists an important, appealing bootleg, unpolished and ephemeral. Germany, 1991. Original wraps. Near Fine. 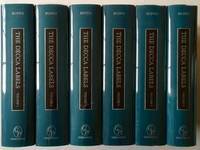 The 1991 1st (and only) editions of Vols. 2-4 of this obscure collection (published out of Germany) of a Frank Zappa discography (live recordings and bootlegs included) . All 3 volumes clean, tight and Near Fine in their multi-colored wrappers. 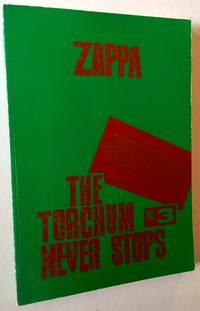 Quartos, essentially uncommon, sophisticated Zappa fanzines, in this case dedicated to pinning down as much of the recorded music as possible -- and doing so with the addition of hundeds of wonderful, creative flourished thruout. Germany, 1991. Original wraps. Near Fine. 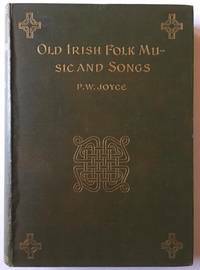 The 1991 1st edition of Vol. 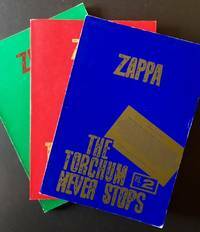 3 of this 4-volume collection of essentially discographies of Frank Zappa, consisting of many of his recordings and pressings from all over the world, with an array of spicy illustrations to keep it all moving nicely. Tight and Near Fine in its dark-green wrappers, with just a bit of light creasing at the edges. Quarto, an unspecified "limited edition"
Germany, 1991. Original wraps. Near Fine. The 1991 1st edition of Vol. 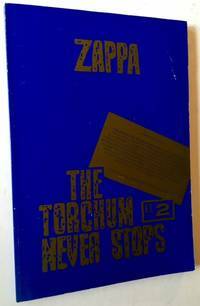 2 of this uncommon 4-volume compilation of Frank Zappa recordings (live recordings and bootlegs included). Clean and Near Fine in its printed blue wrappers. Quarto, heavily illustrated thruout with photos, wonderful doodlings in tribute to Zappa, etc. New York: Charles Boni (Distributed by Simon and Schuster, 1949. Cloth. Very Good +/Near Fine. Miguel Covarrubias. A nice Association copy: INSCRIBED BY W.C. HANDY TO SAXOPHONIST MAX COLE on the front free endpaper. FURTHERMORE, THIS COPY ALSO INCLUDES A 2 PG. TYPED, SIGNED LETTER (WITH ITS VISUALLY-STRIKING "HANDY BROTHERS MUSIC CO." LETTERHEAD) FROM A 79 YEAR OLD HANDY TO MAX COLE, BLUNTLY SPEAKING ABOUT HIS RELIEF OVER THE 1952 ELECTION OF EISENHOWER, HIS OWN REPUBLICAN LEANINGS, HIS DISAPPOINTMENT TOWARD THE AFRICAN-AMERICAN COMMUNITY OVER ITS SEEMING REJECTION OF HIS POLITICS AND CURRENT RACE RELATIONS. A very sharp copy to boot of this 1949 re-issue, which "expands and brings up to date an earlier compilation prepared by the same authors in 1926". Tight and VG+ (several tiny closed tears at the spine crown, just a touch of wear to the front panel's bottom-edge) in an unusually crisp, price-intact ($5.00), Near Fine dustjacket, with the slightest hint of light soiling to the panels. Quarto, illustrated (as was the 1926 original edition) by the great Mexican artist Miguel Covarrubias. Truly a collector's copy. Grenoble, France: Efitions Glenat, 1976. Original wraps. Near Fine. 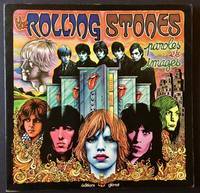 Very uncommon 1976 collection of 40 songs of the Rolling Stones, with the wildly-illustrated lyrics in both French and English. Clean and Near Fine in its wonderful pictorial wrappers, with no wear or markings to speak of. Square quarto, each song's lyrics accompanied by racy --and yet very artistic-- illustrations. And in all 40 instances (and happily so), the artists/illustrators are credited along the copyright page. New York: The Macmillan Company, 1934. Cloth. Very Good +. A tight, very solid copy of the 1934 signed/limited. 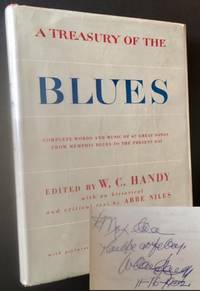 #124 OF 500 COPIES SIGNED BY THE FATHER-SON MUSICOLOGISTS AND FOLKLORISTS JOHN AND ALAN LOMAX at the limitation. Crisp and VG+ to Near Fine in its duotone cloth, with bright gilt-titling along the spine. A touch of light soiling at the spine. otherwise very sharp and, internally, clean as could be, with no writing or markings of any kind. Thick quarto, bright red staining (as called for) to the top-edge, deckled fore and bottom-edges. 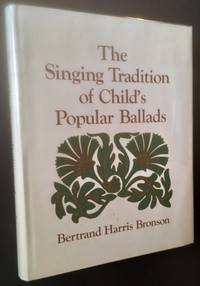 A seminal text in American folklore and in the painstaking collecting of American ballads and folk songs. London and Dublin: Longmans, Green and Co./Hodges, Figgis & Co., Ltd, 1909. Cloth. Very Good +. A handsome copy of the uncommon 1909 true 1st edition. Tight and VG+ to Near Fine in its olive-green cloth, with bright gilt-titling and design along the front panel and spine. Mild foxing to the edges, otherwise clean as could be. Thick octavo, 408 pgs. plus publisher's ads at the rear. Westport, CT: Greenwood Press, 1996. Cloth. Fine. A pristine example of this sweeping discography of the Decca Labels, complete in 6 volumes. All 6 volumes tight, crisp and Fine in their blue cloth, with offsetting black title labels at the front panels and spines. Thick octavos, just shy of 6,000 pgs. all told. Vol. 1: The California Sessions; Vol. 2: The Eastern and Southern Sessions (1934-1942); Vol. 3: The Eastern Sessions (1943-1956); Vol. 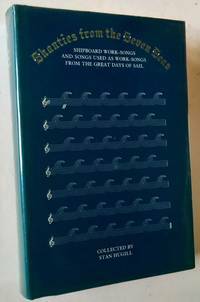 4: The Eastern Sessions (1956-1973); Vol. 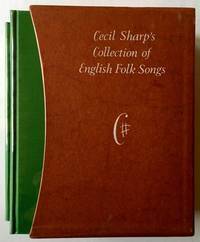 5: Country Recordings, Classical Recordings & Reissues; and Vol. 6: Record Numerical Listings & General Artist Index. GMBH Offenburg (Baden), Germany: Burda Druck und Verlag, 1961. Cloth. Near Fine/Very Good. 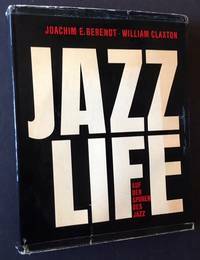 The 1961 true 1st edition of this important jazz chronicle by photographer William Claxton, whose wonderful, rich gravures seem to exactly capture the mood and the place. Tight and Near Fine in a crisp, VG dustjacket, with several closed tears along the panel edges and 3 strips of neat, clear tape evenly applied horizontally across the upper half of the rear panel. Quarto, text (exclusively in German) by Joachim E. Berendt. London: Routledge & Kegan Paul, 1984. Cloth. Fine/Fine. A very solid copy of the 1984 reprint. Clean and Near Fine (spotting at the top-edge and, much less so, along the bottom-edge) in a bright, Fine dustjacket. Thick octavo, 609 pgs. Princeton University Press, 1976. Cloth. Fine/Very Good +. An impressive copy of the 1976 1st edition. Clean and Fine in a crisp, VG+ to Near Fine dustjacket, with one very light, small stain along the front panel/spine. Quarto, 519 pgs. plus Bibliography and Index. New York: Coward, McCann & Geoghegan, 1974. Boards. Very Good +/Very Good +. 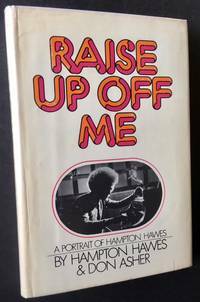 A crisp, tight copy of the 1974 1st edition of this gritty autobiography of jazz pianist Hampton Hawes. 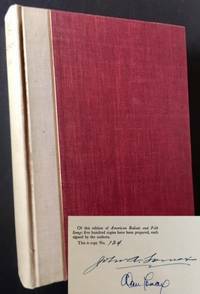 Solid and VG+ (light foxing at the fore-edge) in a bright, price-intact, VG+ dustjacket, with very light rubbing to the rear panel. Octavo, co-written with Don Asher.